I’m feeling a bit tired and dizzy today as I was up until 1 am last night! No I wasn’t out clubbing but was perfecting my recipe for Wholemeal Apple Hot Cross Buns. I’m not much of a one for planning, indeed I’d intended to make a Hot Cross Bread & Butter Pudding this week. But suddenly I found myself deciding to make Hot Cross Buns which I had only ever made once at school. I didn’t really have much of a relationship with bread making in my youth and it’s only in the last couple of years that it’s become a passion of mine. Therefore I felt it was high time that I made my own Hot Cross Buns! So armed with my old school recipe I started my bake. Well the first hurdle was that I only had strong wholemeal flour and not white flour. “I know” I thought, “I’m sure I’ve seen Wholemeal Apple Hot Cross Buns for sale I’ll make those”! A quick google told me that in a taste test some Apple & Cinnamon ones had only scored 4.5 out of 10 so I decided to stick with the traditional mixed spice. I played about with the recipe I had chopping and changing things here and there but stuck to the one rising, which is where I tripped up. After baking, out came some small, slightly over cooked but delicious hot cross buns which were too close in texture and not like the light fluffy ones you buy in a bakery or supermarket. Sometimes I might just give up on a recipe but I could see that there was huge potential here. I just needed to tweak a few things like adding a bit more yeast, giving the dough an extra rise, increasing the proving time and lowering the oven temperature. So at 12.45 pm last night (or should I say this morning) I was giving my husband a portion of buttered Hot Cross Bun and asking his opinion. He did protest that he didn’t want to eat just before going to sleep but I was insistent – “perfect” he said, after finally relenting to my request. “Great, I’ve cracked it” I said and went to bed tired but happy! 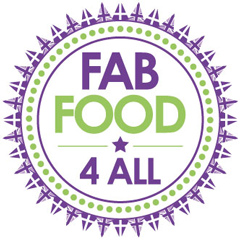 As my Wholemeal Apple Hot Cross Buns are such good value compared to shop bought ones I’m entering them into Credit Crunch Munch which I am hosting this month and which I jointly run with Helen of Fuss Free Flavours. I’m also entering Simply Food’s Sweet Treats for Easter challenge. Then there’s Jibber Jabber’s Love Cake event where the theme is Springing into Easter, I may be bending the rules here a bit regarding cake!. Spring into Easter is also the theme for Treat Petite this month hosted by Cakey Boi and alternately with The Baking Explorer. Finally I’m entering the Made with Love Mondays which is hosted by Javelin Warrior’s Cookin w’luv as these buns are totally made from scratch. 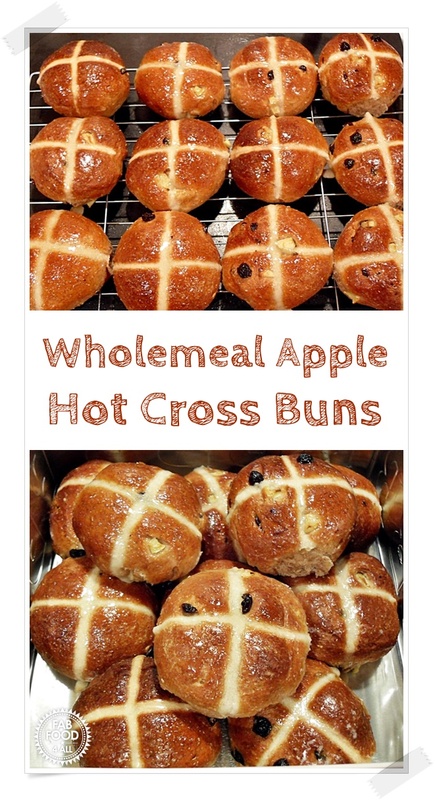 A Wholemeal Apple Hot Cross Bun without mixed peel but with apple, currants and mixed spice for a really delicioius alternative to a traditional version! Mix the warm milk and water with the tsp of sugar and sprinkle on the yeast, set aside while you prepare the rest of the ingredients (a nice froth should build up). Put the flour in a large bowl and cut the butter into it and then rub into the flour to form fine crumbs. Mix in the mixed spice, salt, caster sugar, currants and apple thoroughly. Make a well in the centre and add the yeast mixture and beaten egg and form a dough – I used my hand for this as you can gauge the consistency better – adding extra flour or milk if needed. Once you have cleaned the sides of your bowl with the dough, tip out onto a work surface and knead for 10 minutes. Then put the dough in a lightly oiled bowl, cover with cling film and leave in a warm place for 1 – 1 ½ hours until doubled in size. Once risen turn out onto a lightly oiled work surface and knock back all the air and knead until back to its original size. Make 12 balls of dough (I weigh the dough and divide the figure by 12 so mine weighed 65g each). I also knead each ball into a neat bun shape. Place the dough balls onto a lightly greased baking tray 3cm apart, cover in lightly oiled cling film and put to rise for about 45 minutes or until doubled in size. Meanwhile make up the cross mixture by mixing the flour and water together to make a smooth paste. Place paste in a piping bag with a small plain nozzle or make your own out of baking paper and snip off the corner when ready to use. Make the glaze by heating the sugar and water in a small pan until the sugar has dissolved. 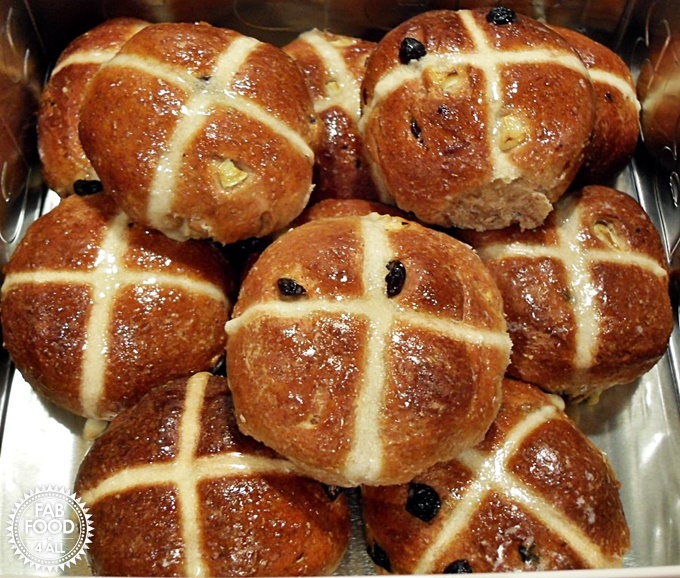 When the buns have risen mark each one with a cross using the side of a metal scewer (so that you have a line to fill with the cross mixture). Pipe the flour paste crosses onto the buns working all the way in one direction across the buns and then in the other. Bake for 12 – 15 minutes (turning towards the end if necessary for an even bake). Once ready take out of the oven and using a pastry brush paint the glaze over each bun. Place the buns on a wire rack and either serve warm or cold with butter. 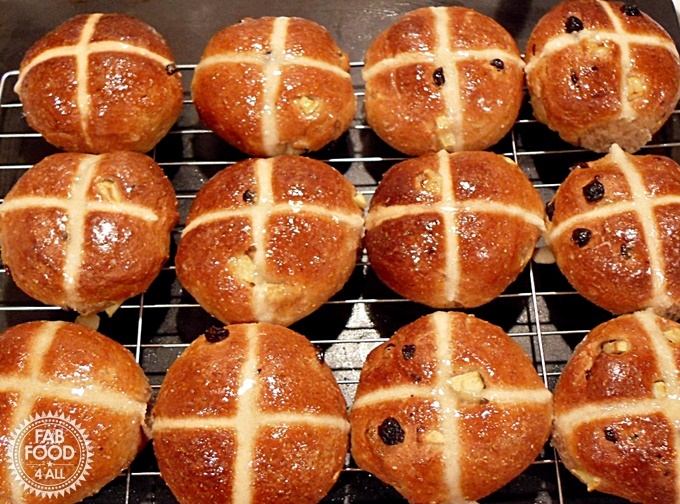 Oh my, these hot cross buns of yours are making me soooooooooo hungry! 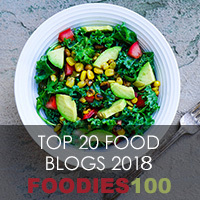 Love it that you used wholemeal flour and apple too – my sort of bake. I love shine on yours! they look great and I love the flavours. Thanks for linking to my carrot and ginger hot cross buns.